Major Hollywood projects come and go for various reasons. Budgets fall apart. Talent exits for greener pastures. Trends that once were hot go ice cold. But rarely do we get the kind of behind-the-scenes feedback regarding what went wrong on an anticipated blockbuster as Chris Weston gives us now. Weston is a British comic artist whose credits include titles like Judge Dredd and Swamp Thing. He transitioned to the film industry by doing storyboards and concept art for The Book of Eli with the Hughes Brothers. And for the past year, Weston worked as a production artist on Albert Hughes’ planned live-action version of Katsuhiro Ohtomo’s anime classic Akira. Even though the project reportedly isn’t happening any time soon, Weston takes to his blog to inform fans that pulling the plug on the project probably was best for all involved. As if we didn’t already know that from the moment a live-action Akira was announced. So what went wrong? Weston says one of his first assignments on Hughes’ film was to redesign Kaneda's motorcycle. “I was as horrified as you are,” Weston admits, “probably more, 'cos I was the one the fanboys were going to come for when they inevitably declared it a travesty.” He also says there was a brief discussion about turning the protagonist’s bike black, which to borrow Weston’s own word would have been another travesty. At the very least, they took into consideration that Kaneda, the lead protagonist, is part of a biker gang in the story, so they dirtied to look of the cycle and gave it some significant battle dents. Now it’s all for naught. Weston is short on specific details, saying everything he produced on behalf of the production is protected by legal documents. Plus, he added that his designs might “see the light of day” some day if a live-action Akira finds a proper director and cast. But I think the best thing Warner Bros. could do is cut their losses when it comes to Akira. There’s already a perfectly good version of Ohtomo’s futuristic graphic novel, and it’s animated. 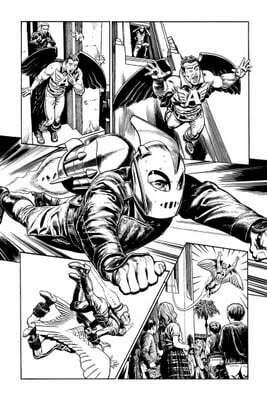 Speaking of animated, Weston says he concurrently worked on his own book, The Twelve, and capped the blog post with sketches from the upcoming Rocketeer Adventures 2, written by Mark Waid and on sale now.